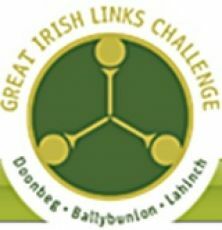 Three of the world's finest golf courses -Ballybunion, Doonbeg, and Lahinch- are proud to present the Great Irish Links Challenge, an unprecedented occasion to play these legendary links courses of the Emerald Isle. This monumental four-day event also features an opportunity to enjoy renowned accommodations and experience the famed Irish hospitality. 600 golfers will play three unforgettable rounds of golf with the finalists vying for daily prizes at each course and the title of Great Irish Links Champion. Cost of entry €595 per person. From the mighty Shores of Ballybunion, the seaside town in County Kerry welcomes you to its famous links – The Old Course. Ballybunion is often camp base for a few days in Ireland as once around this majestic links is never enough. In the top 20 of the world rankings says all you need to know to want to play this majestic course! Held the Irish Open in 2000 , European Seniors tour in 2009 this course is on the pathway to Heaven. Ballybunion Old Course was made internationally famous in the 1980 by a American PGA player Mr. Tom Watson. Playing the Old course one week before the British Open each year Tom went on to win FIVE British Opens and thanked Ballybunion for its help in making that happen. Hearing this the world of golfers wanted to play this seaside Links that we have today. Tom Watson honoured Ballybunion Golf Club by accepting the role of Captain in 2000. The Back Nine of Ballybunion Old is a testing as it gets with the signature hole the 11th par 4 the most desired hole in the world of links golf ! Today Ballybunion Old Course is the most requested course of play in Ireland. Follow in the footsteps of the greats of this world and make Ballybunion Old Course your choice this year. The Links of Doonbeg Golf Club, I was there when Greg Norman came to Doonbeg to launch the building of this new course. For each day I arrive at Doonbeg through the arch and into the Courtyard I feel at home. The place is indeed a FIVE STAR class act, from the minute your car or coach arrives into Doonbeg to getting breakfast and onto the links the welcome, style and passion for golf climbs to a new levels. Indeed the course standing on the first Tee box as the starter details the history of Doonbeg and your looking down the finest par Five opening hole of links golf in Ireland today ! Several changes were made updating this links course to what it is today and Doonbeg doesn’t stop there. They have a caddie program that’s second to none and did I forget to tell you about lunch at Darby’s Bar overlooking the 1st hole after the golf with a welcome pint of Guinness! I say this because it is another traditional Links from start to finish and the changes made Dr. Alister Mackenzie 30 years later have stood the test of time! Martin Hawtree design was called apron in 1999 after coastal erosion got a much improved protection and he thus found two new par 3 holes deep in the sand dunes the 8th hole was a jewel of this course awaiting to be found! The 11th just stunning while all the time maintaining the tradition this links this course is known the world over. Just five minutes away from the Lahinch courses is the famous Cliffs of Moher! Staying at Ballybunion for the Great Golf links Challenge only makes sense. Delighted to have you take the Challange - if you Dare !!!!! !